Last week, Disney fired director James Gunn from Guardians Of The Galaxy Vol. 3 after right-wing trolls dug up some tasteless jokes he had made on Twitter a few years ago. The move prompted various actors from the Guardians movies to come forward with messages supporting him, including one heartfelt post from his brother Sean Gunn about how the Guardians movies helped him move past his misguided attempts at offensive humor and had allowed him to grow as a filmmaker. Meanwhile, nearly 350,000 fans signed a petition asking Disney to re-hire Gunn—who, for the record, had already apologized for the offensive tweets before they resurfaced—for the third Guardians film. Today, the Guardians Of The Galaxy actors have released a new joint statement, showing their support for Gunn and highlighting the fans who want to see him re-hired for Vol. 3. The statement, which is signed by the whole core cast of Vol. 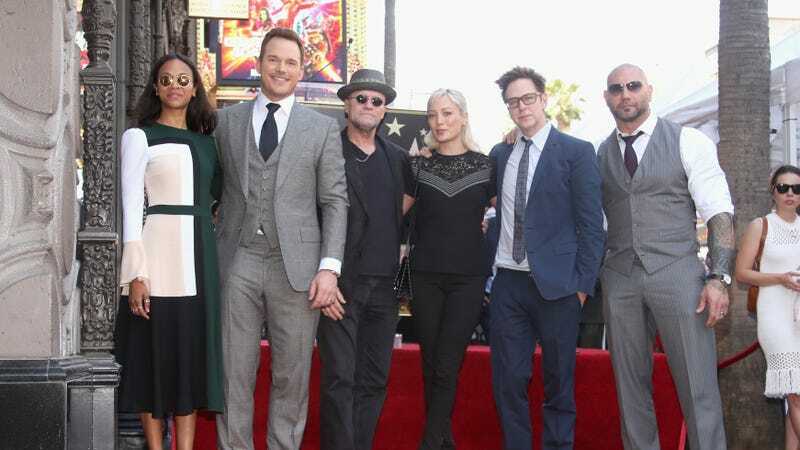 2 (specifically Chris Pratt, Zoe Saldana, Dave Bautista, Bradley Cooper, Vin Diesel, Sean Gunn, Pom Klementieff, Michael Rooker, and Karen Gillan), stops just short of literally asking Disney to reinstate Gunn, but it does note that all of the actors listed are looking forward to working with him again in the future. It also notes that “there is little due process in the court of public opinion” and that we as a society should “ease up on the character assassinations and stop weaponizing mob mentality.” You can see the full statement below.